Do you have a growth mindset? Do you even know what a growth mindset is? Maybe you do. But until recently, I didn’t. And when I went on a little journey to learn more about it (and how to get one o’ them fancy mindsets for myself), what I learned kind of blew my mind… set. When I say Michael Jordan, what comes to mind first? You might expect any of those answers. But what about hard work? Did that make your list? And if so, how far down? When the typical sports fan watches clips of Jordan and sees his career stats, they picture the talent he had to possess to achieve that. But what does Jordan think about Jordan’s career? If you listen, you’ll hear him say it many times: incredibly hard work is what made him the legacy he is today. The gist: Most introverts face these five challenges on the journey to build their leadership skills. Each one can be overcome with a unique approach. Giving a singular voice to a group of people is hard work. Finding the little things that make people tick and motivating them toward a common goal is equally difficult. Those are big leadership challenges. If you’re an introvert with big ideas, you must be up to the task. Your natural, introverted skills will propel you and your team forward, but you’ll also struggle with some fundamental challenges that keep you from stepping into a leadership role in the first place. We’re always on the lookout for new research and ideas to help you capitalize on your natural strengths and succeed as an introverted leader. Self-doubt. You’re unsure of your own leadership skills. Trouble being perceived as a leader. You may be confident, but others don’t see you as their leader. A lack of leadership skills. You know you don’t have the skills you need, and you’re not sure how to get them. Feeling inauthentic. You hesitate to lead because it doesn’t feel natural. No time / energy to lead. You’re already doing too much and you’re too tired to take on the responsibility. If any of those answers sound familiar to you, then keep reading. We’ve assembled a complete guide to recognizing and fixing each of these roadblocks to leadership in yourself. The world needs more introverted leaders, and you can become one of them—quietly affecting the lives of those around you for the better. The gist: Introvert. 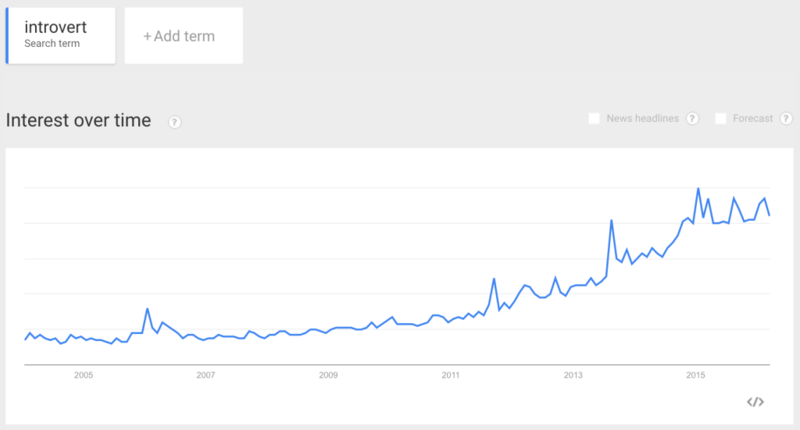 The word is more popular than ever. But what does it really mean? And are you one? We went to the end of the earth to find out. So, we set out to answer the question once and for all. We dug into the history of personality science. We scoured the latest research and analyzed pop culture references. And we interviewed highly credentialed professionals in the field. Have deep, rich inner-lives. It’s hard to overstate how “inside their own heads” introverts are. Prefer solitude to busy environments. Introverts are most at home… at home. Enjoy people, but prefer fewer, deep relationships. It’s all about quality over quantity. But boiling down an entire personality type to just three bullet points can’t begin to explain the complex and fascinating traits of introverts. So, where to start? How about at the beginning. The gist: Big ideas need not be championed by big personalities. Introverts are equipped to create tipping points by quietly influencing large groups from within. If you’ve spent any time listening to the politicians, CEOs, and gurus of the world, you’d be forgiven thinking that, to lead people or get them to listen to your big ideas you have to be an outgoing extrovert who spends every waking moment shaking hands and kissing babies. You have to get in front of everyone. But is it true? No, it is not. You don’t have to go on a world tour or try to evangelize to everyone you meet to be a leader and make a difference in people’s lives. Actually, you can make big things happen just by connecting with a few people. When you connect with the right people, you can share your idea, sell your product, get people to use your app—whatever it is you want to influence—without overwhelming yourself. When you have a great idea and you communicate it to the right people in the right way, you can achieve a tipping point—the point where your idea will continue to spread without any effort from you—quickly and without burning yourself out. If you’ve always thought you had to pretend to be an extrovert to get people to pay attention to your ideas, this could be a life-changing realization. In fact, introverts have a natural advantage when it comes to sharing powerful ideas. They’re hard-wired to build deeper connections with fewer people, so we naturally reserve our energy and focus it on the people who are most aligned with us. In fact, if you want to get better at creating tipping points for your ideas, products, whatever, then you’d benefit from learning to be more like an introvert. But how do you get started? How do tipping points really happen, and what do you need to do to make sure your ideas have the best shot at reaching one? The gist: When your priorities are out of order, you create a lot of unnecessary work for yourself. Adjusting can be scary, but the result can make you faster and more creative. I’ve felt the same many times. I’d sit down at my desk and, before even starting, I’d say to myself, “There’s no way I’m going to get everything done.” Defeated from the beginning. This problem might be worse for introverts who work in a company where personalities don’t always match the task. You get sucked into meetings, the chatter is loud, and the environment can exhausting. But there’s good news. If you haven’t taken a hard look at the way you do your work, there are probably some incredible opportunities to eliminate a large portion of your daily workload. Source here. This was part of a recurring study, and it also found that the problem was getting worse every year and “workload” was one of the top reasons why.